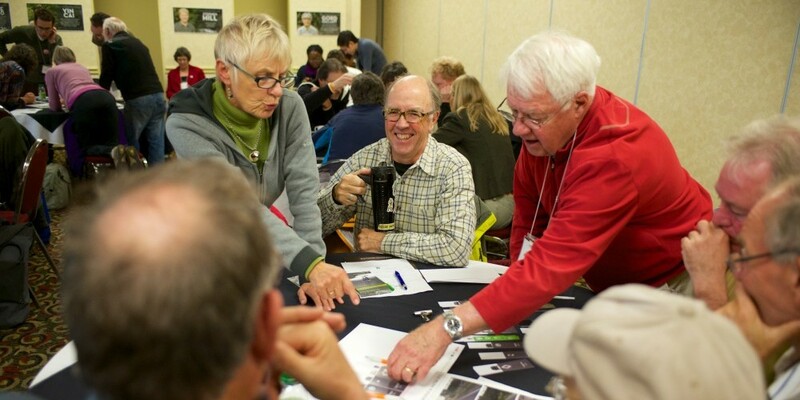 The Complete Streets Game is a capacity-building workshop tool that enables participants to play with re-arranging and rebuilding their neighbourhood streets and to visualize what the opportunities and options can be. The game is a fun, interactive exercise that helps groups understand the size and scale of different modes of transportation and work collaboratively to re-imagine a local street as a complete street. The game’s easy accessibility equalizes public space and allows everyone to have a chance to design a street without having to measure or draw. Over the past five years, the Complete Streets Game has been used across Canada by non-profit groups, business improvement associations, schools and public health and planning staff to collaboratively re-imagine streets in a fun, accessible and interactive way. Its success as an engagement tool has led us to develop Version 2.0, a more durable, bilingual edition with magnetic street sections that have been expanded and updated to match the most current transportation standards. Each game contains a set of graphic magnets that represent different components of streets (e.g. bike lanes, sidewalks, bus lanes, vehicular travel lanes, trees, benches, etc. ), drawn to scale. Players work together to arrange and re-arrange the magnets and build consensus as to their ideal street cross section. Version 2.0 is currently in production, and a limited number of copies will be available in Spring 2018 for $25+shipping.